Indians have started exploring the world. You can see people traveling abroad more often nowadays than before. Recently a friend of mine went to Singapore for some business trip, and used some credit cards. I thought it would be good to share his real life experience and give a review about which card or cards are most suitable to have a hassle free trip abroad. This post will help you find best credit cards for International travel. Airmiles or reward points that can be redeemed or converted for Airmiles. Look for markup charges that are applicable to the credit cards. Usually its between 3-5%. For example, if you spent Rs 2 lac on your foreign trip, and if your card has 5% markup fee, then you will end up pay Rs 10,000 to the bank as markup fees. Before going to see what are the best cards for International travel, here are a few tips. If you have cash, and are not a frequent traveler, and things like reward points don’t matter to you, you can easily travel abroad with your International debit card. I have used one of Oriental bank of commerce and SBI, and both work perfectly. Try and pay with your card and don’t withdraw cash from ATMs unnecessarily. ATM cash withdrawal will see some charges. Europe and Central Asia is pretty much cashless, so your card will work well. But, you need to carry some cash when you’re traveling to south east Asia. So if you’re planning on a foreign business trip or for dream holidays abroad, here ares some of the best cards in this category. Note that each card has some pros and cons, find one which you think is best for you and your needs. I will keep updating the list. As they say, money follows money. This is the best card out there, with a lot of premium features, low transaction rates and all, but not all can get this. It’s a very premium card and only people with a minimum of Rs 50 lac income a year, can apply for it. Welcome privilege of 50,000 reward points on your first transaction. While traveling overseas, it gives Rs 50 lac cover on medical emergencies. Dedicated website to redeem your reward points to book flights, hotels and movie tickets. Gives unlimited complimentary access to lounges to the card holder and to the add-on holder. Main attraction is just 1.75% of markup fees on all the foreign transactions while traveling abroad. This markup fees is usually the main source of income for the banks here and this card has the lowest that you can get. This card is equally good and affordable to many. 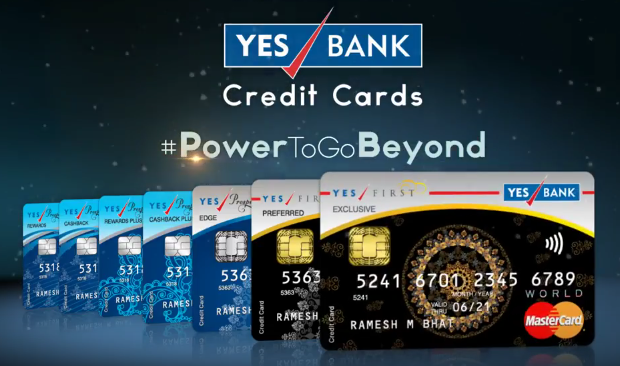 One need to have a minimum gross annual income or salary of Rs 18 lacs to be eligible for this credit card. Welcome privilege of 15,000 reward points on your first transaction. While traveling overseas, it gives Rs 25 lac cover on medical emergencies. Gives 4 complimentary access to lounges to the card holder and to the add-on holder. Main attraction of just 1.75% of markup fees on all the foreign transactions while traveling abroad, is still there in this card. It’s a card that may not be the cheapest of all the cards in it’s category but it surely comes with a load of features. It offers very competitive foreign exchange conversion rates as well at 3.5%. Loads up to 16 currencies on a single card and enjoy the world. It has a lock in exchange rate feature as well, so that even if the currency rates fluctuate, you pay only at the rate you loaded or reloaded your card. Theft of card is a big issue while traveling abroad. This card gives you emergency cash to pay your bills, flight tickets etc in case you lose your card. Yes, Regalia makes in this list as well. In fact, it’s the best card if you don’t have much time to reload your card with foreign currency or look into tons of features in other cards. Again, not for the masses, you can only apply for ever famous Regalia card, if you earn a minimum of Rs 1.2 lac a month. If you are in this group, it is the best credit card to have. Foreign markup fees are very low, at 2%+service taxes. 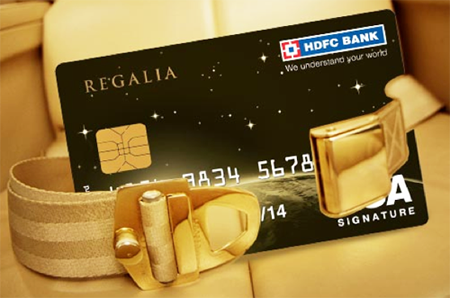 Dedicated website, www.hdfcbankregalia.com, to redeem your reward points. Both primary card holder and additional card holder can enjoy 6 complimentary access to International priority pass lounges in a calendar year. Protection of up to Rs 15 lac for emergency hospitalization abroad. Rs 1 crore compensation in case of an air accident. It is a prepaid forex card, exclusively designed for foreign travel. The foreign exchange conversion rates here are as per HDFC bank rates, which are somewhat higher. 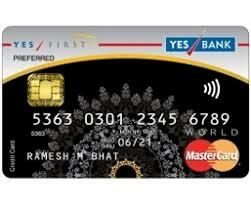 You need not be an HDFC customer to apply for this card and there are no explicit eligibility rules to get this card. Just show a purpose to travel abroad, load your card and you are good to go. No income related eligibility criterion here. 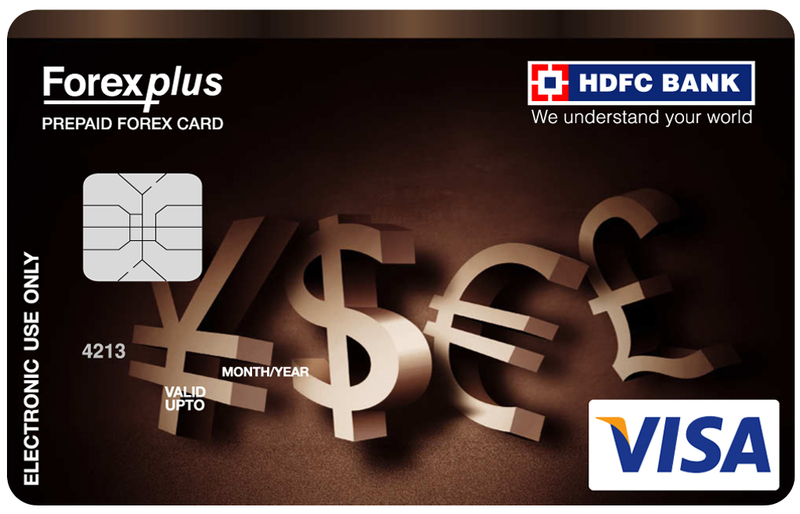 After activation, HDFC bank holders can directly transfer funds online to this forex card. Protection against the foreign exchange fluctuations. Great feature if you’re travelling to middle east or Europe nowadays!! Protection of Rs 5 lac for misuse/loss of card. Card issuance fee is Rs 125. Reload fee is Rs 75 per reload. 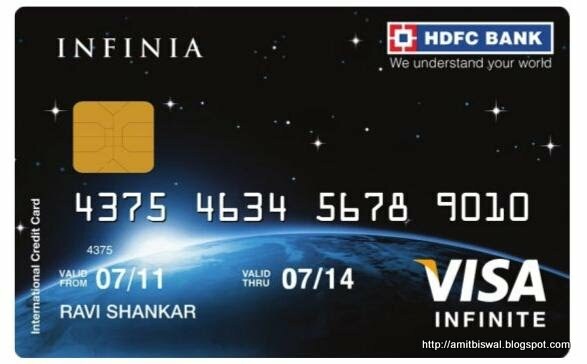 HDFC Infinia Card is for frequent travelers who don’t want to worry about credit limits. It comes with a minimum credit limit of Rs 10 lac. Gives you access to 700 airport lounges globally by providing you a complimentary priority pass membership. Both you and the add-on card holders may utilize the facilities of the lounges. Low foreign currency markup fees of 2% on all foreign transactions. A compensation of 3 crore in case of death in an air accident while a cover of Rs 50 lac in case of medical emergencies abroad. You can convert reward points into AirMiles for both international and domestic airlines. Golf lover? Yes, it gives you access to some of the finest golf courses in the world as well. Please comment if you have used or found any other good card for foreign travel. Tell me which cards do you want to see from position 7th to 10th?